Having your own home gym has its pros and cons. One of the cons is the space it can take. If you do not have adjustable dumbbells, but regular ones, then you do not want them lying around. You need a rack and not just a regular one, but one of the best dumbbell racks on the market. In short, a dumbbell rack is a specially designed and welded piece(s) of metal (usually heavy duty steel) that can hold number of dumbbells either in a row or on separate vertical tiers. 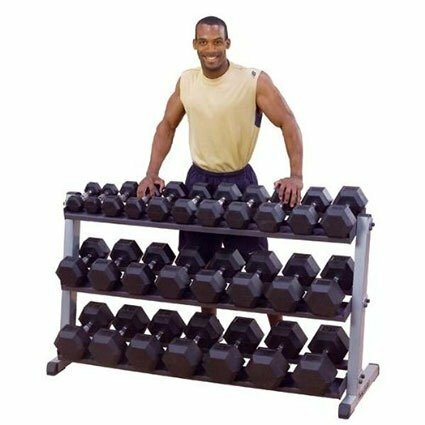 The dumbbells should be easily retrievable from the rack and should not wobble or wander around, once placed on the rack. Dumbbell racks come in different colors, variations and designs and we will take a closer at six of them which are being held in high esteem by users all over the world. Okay, now we know the basics, so let’s dive right into our list of the 6 best dumbbell racks. The racks on the list are in no particular order and we added personal rating according to our own opinion. Three-tier multilevel dumbbell rack by Marcy made it to our list because of the customer satisfaction and quality provided by Marcy. The rack is made of heavy-duty commercial steel, which, according to the manufacturer is built to last long. It is reinforced with a strong powder-coated finish and should not be tarnished easily. The rack also has compact design with 3 vertical levels, offering lots of space for your dumbbells, while not taking too much space itself. The rubberized feet offer great stability on all kinds of floors. The dimensions of the rack are 38 x 22.5 x 6.5 inches (96.5 x 57.1 x 16.5 cm) and the weight is 59.5 pounds (27 kg). Another dumbbell rack that made it to our list is made by XMARK. The brand has been on the market for some time and is well known among fitness equipment users. 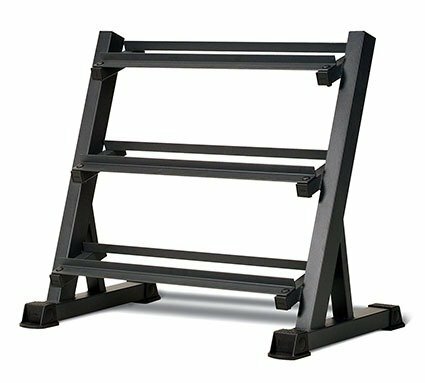 The XM-4439 rack is also made of heavy duty steel and is built to last. With the 3-level design it can hold as much as 18 dumbbells (6 per level). The rubber feet provide great stability on carpets and wooden floors alike. The rack can be order with all kinds of dumbbells or empty and comes in two colors, grey and white. The product dimensions are 53.25″ x 21″ x 32″ (135 x 53.3 x 81.3 cm) and each shelf is 48″ (122 cm) long. No, we are not fans of just three-level dumbbell racks. However, his fella by Merax definitely deserves a position among our list of best dumbbell racks. 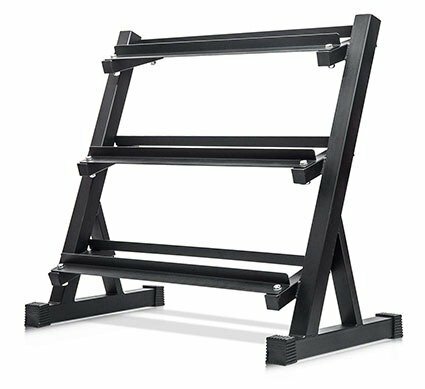 As with most dumbbell racks, this one is also made of heavy-duty steel with reinforced and solidly welded constriction. 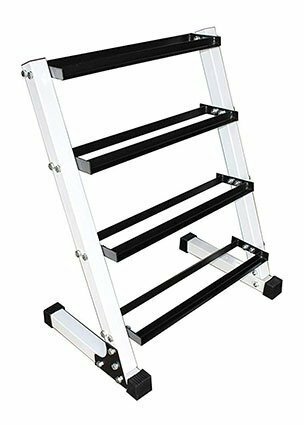 It is well designed, with angled anti-slip individual racks to allow easy storage and to prevent accidental dumbbell slip. 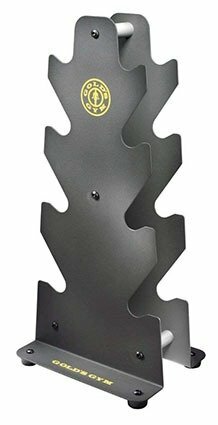 Great addition is the black powder coating, which, according to manufacturer is scratch-resistant and should not chip over time. Rubber feet at the base of the rack provide great stability. Max weight capacity is set to 800 lbs. The rack comes in black color and Merax offers 1-year warranty. The dimensions are 36L x 21W x 33H inches (91.4 x 53.3 x 83.8 cm). Assembled weight is 51 lbs (23.1 kg). Horizontal dumbbell rack by Body-solid is made of heavy-duty steel and is made for commercial and home gym use. As mentioned, the rack is made of heavy-duty steel with 3-level design an all-side welded constriction. Each particular level is slanted, thus allowing unrestricted access to each dumbbell. The mainframe provides a reversed-pitch design, so you won’t bump from one tier to another. The rack can hold dumbbells of 5-70 lbs. The included rubber feet provide great rack stability. 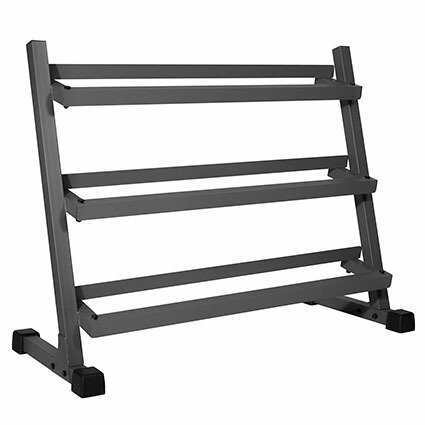 The rack is available in grey color. The dimensions of the rack are 32″ H x 23″ L x 62″ W (81.2 x 58.4 x 157.5 cm). The weight is not specified by the manufacturer. Dumbbell rack by Ader Sporting Goods is the only 4-level which made it to our list of best dumbbell racks, which are worth your money. The rack is fully powder-coated and is made of 2”tubing with angle steel with quality welds. According to Ader Sporting Goods manufacturer, the rack should last years. The rack is capable of holding all kinds of dumbbells, including chrome, hex and rubber ones. Synthetic rubber feet covers are anti-slip and designed to be placed on all kinds of different floors. It’s available in one, black & white color combination. Product dimensions are 18″ (D) x 28″ (W) x 38″ (H) (45.7 x 71.2 x 96.5 cm) and the total empty weight is 50 lbs (22.7 kg). The last but not least dumbbell rack which made it to our list of best dumbbell racks is manufactured by Gold’s Gym. This particular rack is made of durable steel and provides eight slots for your dumbbells. It can hold up a total of 160 lbs of weights. The 3-tier design holds four sets of weights. Due to uncommon design, it takes very little space on the floor and thanks to the balanced base, it won’t tip over. The Gold’s gym 3-tier dumbbell rack dimensions are 26.2 x 12.7 x 3.2 inches (66.5 x 32.3 x 8.1 cm) and the empty weight is 12.9 pounds (5.85 kg). There you have it. That concludes our list of best dumbbell racks on the market that are worth your hard-earned money. Make sure to check the dimensions, so your selected rack will fit your available space properly.